Easy piano sheet music FREE, The Snake Charmer with left hand chords! This melody is mysterious-sounding and FUN. The Snake Charmer has a familiar melody, but new (and polite) words. 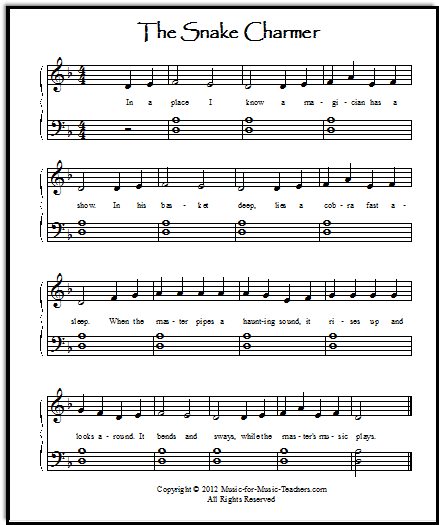 Because this minor-key melody has a history as one of those school playground songs with less than refined lyrics, it took me some time to decide to give it to students. Please scroll down the page for the link to the printable PDF. 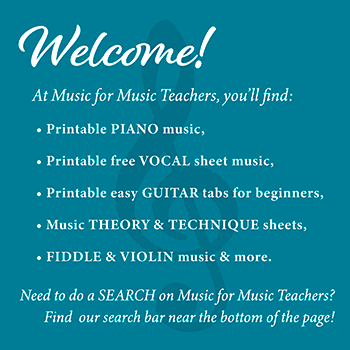 If your students are just starting to coordinate left hand chords with right hand melody, this easy piano sheet music will almost certainly be a hit. But this song is way beyond the ease of putting hands together that occurs in Mary Had a Little Lamb. Reading and executing thirds or "skips"
What places The Snake Charmer in a different category? The little skips (3rds) and melodic turnarounds. I like to say to my students, "This is one of those twisty-turny melodies that tries to fool you! Be on the alert!" This easy piano sheet music is fun to practice low ("down in the dungeon"), in the middle of the piano ("the castle throne room") and way up high on the piano also ("the tower"). I call this "Castle Practicing," and if I quickly sketch a castle on my student's lesson sheet, it means I want them to practice it this way, for a repetition of 3 times. (You could also add "drawbridge" and "Queen's Chambers, or Queen's Boudoir" for more repetitions.) This is handy for a student who isn't actually reading words yet! Don't let a good song go to waste - now transpose it! The Snake Charmer is also a good song for transposing, as the melody all fits into a 5-finger pattern. Once kids know this piece well, they enjoy the challenge of moving from Dm to Am, to Em, to Cm and Gm, and finally the trickier keys of Fm and Bm. By then, it is certainly time to choose a different song! But my students who have made it through the gauntlet of the black-key pentascales (Ab, Bb, Db, Eb, Gb) are ready to also try the minor variations on these positions (G#m, Bbm, C#m, Ebm, and F#m) on Snake Charmer. We usually choose a different Transposing a minor melody seems harder for young musicians than transposing a major song!